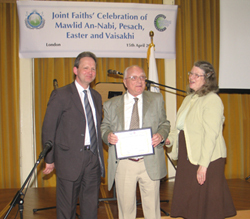 Jack Lynes, who explained what Passover has meant to him and the customs his family practices in a speech entitled, 'Passover - the Freedom Pass' was presented an Ambassador for Peace award for his voluntary interfaith activities during the Joint Faiths Celebration on April 15th, 2010. 'As we listen again to the story of Passover and explain to our children why ‘this night is different from all other nights’ and argue over the various traditions that have come about through the ages, we are often perplexed at a slight discomfort within ourselves. True, our ancestors seem to have managed their escape very successfully.